Richard Serra is widely considered to be the most important sculptor of the last half century. The subject of a recent 40-year retrospective at MoMA, he's most famous for his massive Cor-Ten steel sculptures in urban areas throughout the world. Cities including New York, London, San Francisco and Paris (to mention only a few) all feature prominent installations of his work. And, perhaps surprisingly, so too does King City, a mostly rural area about a half an hour north of Toronto. 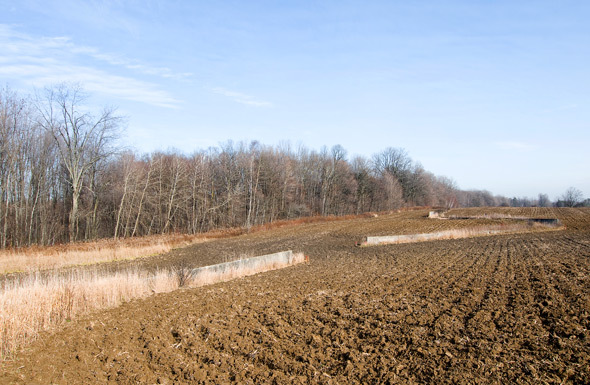 An early example of Serra's site-specific landscape work, "Shift" (1970-72) was originally commissioned by a Toronto art-collector named Roger Davidson. And though Serra went on to become an artist of global renown, over the years "Shift" slowly became something of a secret, known only to area locals and art-historians. Until a few weeks ago, I had never heard of the piece. But recent developments related to the sculpture's long-term fate were occasion for "Shift's" return to the attention of the mainstream media. Rumors of the work's inevitable demise had been swirling since Davidson sold the land to a developer (Hickory Hills Investments) around 1980. Although Hickory Hills agreed not to "harm, alter or destroy" the sculpture, they offered no guarantees that they would protect or maintain Serra's work either. 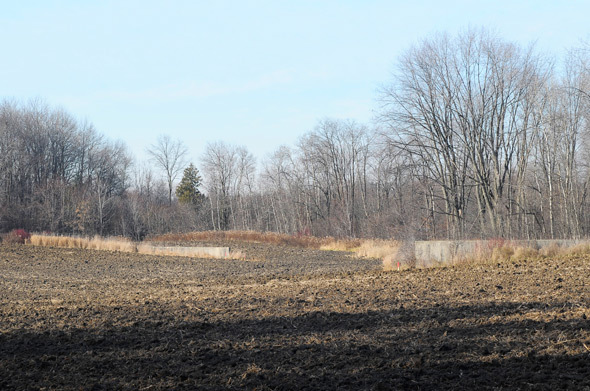 Not only that, despite various attempts by King City council to have the owner of the land designate "Shift" a "cultural landscape" under the Ontario Heritage Act -- a move that would ensure the long-term upkeep and provision of public access to the site -- Hickory Hills steadfastly refused. The story does, however, have a happy ending. Despite an earlier reticence to pursue such a designation without the owner's consent, on November 30th, council voted 6-1 in favour of granting heritage status to Serra's sculpture. So, after following the story in the papers and researching other art lovers' journeys to the site, I decided that it was time for me to make the trek myself. Though the heritage designation ensured the long-term existence of "Shift," I was anxious to see it before the first snowfall. As my companion and I headed up highway 400 toward King City, I couldn't help but think of my recent discovery of the work of the Canadian sculptor Gord Smith. How easy it is, I mused, for art of such importance to be forgotten, relegated, as it were, to the dust-heap of history. Thankfully, however, this is unlikely to be the fate of "Shift" (or Smith's work for that matter). And yet, it's also not a widely known or visited installation. While the sculpture will be preserved, in the absence of consideration and appreciation, even masterworks become meaningless. It would be a profound shame if "Shift" was to become merely a cultural artifact, rather than a "living" and relevant artwork. For ultimately, it's the dialectic between the artistic object and the viewer's experience of it that is crucial -- and not just to a work's success, but to its very status as art. Locating "Shift" is not as difficult as it once was. With a little bit of direction and access to Google's satellite maps, the site is far from hidden. But, on the other hand, you still need to be a somewhat savvy when making the trip to King City. Having identified a few landmarks, my friend and I parked the car beside a non-descript field and started our journey west from Dufferin St.
For the first few hundred metres, it was impossible to be sure if our cartographic efforts had been successful. 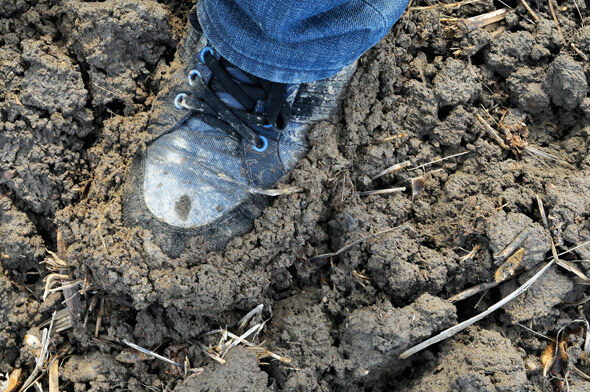 To make matters worse, recent rains meant that the harvested soy fields were a muddy mess. But, trek on we did, and upon reaching the end of the first field, we finally made it to our destination. At first glance, "Shift" struck me as a bit of an aesthetic let-down. Even though the field had been tilled, the installation nevertheless appeared to be half-buried. The concrete out of which the sculpture is fashioned is also far from pretty, and its weathered surface shows the wear of its many seasons. But, despite this first impression, when I managed to walk up to and around the piece, something almost magical happened. Perhaps it was the the beauty of the hazy, late fall day, or the fact that we had built up a sweat trudging in from the road, but after having reached the Serra my mood was suddenly that of awe and content. We had arrived. The air felt almost spring-like, with the damp smell of mud wafting upwards from the field. I no longer cared about the state of my shoes or the struggle that would be the walk back to the car. No, in place of these perfunctory concerns, I was drawn to enjoy and engage fully with the almost 40 year-old structure. "Shift" is challenging in the way that almost all good modern art is. It doesn't reveal its meaning or its beauty quickly. But given the chance to dwell upon it for a while, it's impossible not to acknowledge the seamlessness by which it's incorporated into the landscape. In speaking of his intentions for the installation, Serra reveals that what he "wanted was a dialectic between one's perception of the place in its totality and one's relation to the field as walked. The result is a way of measuring oneself against the indeterminacy of the land." Though Serra's work has at times been termed monolithic, nothing could be further from the truth here. Not only is the boundary of "Shift" defined by the "maximum distance two people [can] occupy and still keep each other in view," but the structure also emphasizes the natural curvature of the terrain, rising and falling in direct proportion to the land itself. Its scale is thus determined by a sort of parallax effect, whereby the most distant reaches of the sculpture blur with the land. "Shift" is also a profoundly human structure. The maximum height of each shifting wall is five feet and hence at eye-level. At no point does it ever disregard the viewer or the land. But this human quality also extends beyond the formal elements of the sculpture. As I was preparing to visit the site, I tried to get my hands on as much information about it as possible. In doing so, I came across a wonderful article written by King councillor Cleve Mortelliti in which he recounts his experience of stumbling upon the sculpture as a child. 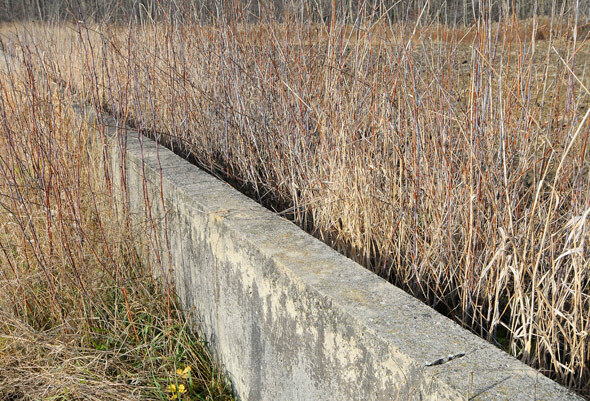 When he first encounters "Shift," Mortelliti and his friend speculate as to its purpose and origin, guessing that it might be a foundation for a building that was never completed or an irrigation system used to regulate water flow through the field. It's only much later that he discovers that what he came upon that day was actually a work of art. This later realization is, however, surprisingly beside the point. As a ten year-old, he and his friend may not have known exactly what it was that they saw, but they knew it was "man-made," or, in more contemporary parlance, a human construction. And this is what I (and Mortelliti himself) think is the very point of "Shift." To borrow a phrase from Kant, Serra's sculpture shows purpose without purposiveness. Although it refuses to make a singular or fixed statement, "Shift" still serves as a reminder of the relationship between humans and their surroundings and as a model that illustrates the possibility of our mutual and non-destructive co-existence. It is a sign that says we were here, and that we hope to leave a trace of our presence. And thanks to a brave group of King City councillors, these basic but crucial messages will live to be "read" by generations to come.